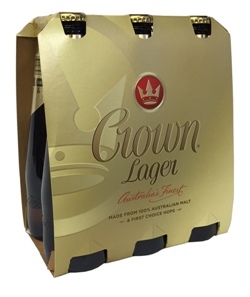 Crown Lager is complete with a creamy fruitiness, rich malty mid-palate and crisp clean hop, leaving you with a full flavoured premium lager taste. The best beer. Easy to drink and a great taste. Drinking crown lager makes me feel like I'm back at home, its a such a superb ... Need to refil for upcoming ashes!!!! This is the finest beer to grace the planet, a more refined VB! What a great drink, worth every penny but must admit over here it is a bit on the pricy side.